"The manager's job is to make human strength effective and human weakness irrelevant." "I am often asked by management students and middle managers, 'How can we make the changes you talk about if we are not at the top?' I reply, 'You can begin where you are, whatever your job. You can bring new insight, new leadership, to your team, your group." "As they say, 'None of us is as smart as all of us.' That is good because the problems we face are too complex to be solved by any one person or any one discipline." These are just a few of the insights collected in Leader to Leader, an inspiring examination of mission, leadership, values, innovation, building collaborations, shaping effective institutions, and creating community. Management pioneer Peter F. Drucker, Southwest Airlines CEO Herb Kelleher, best-selling authors Warren Bennis, Stephen R. Covey, and Charles Handy, Pulitzer Prize winner Doris Kearns Goodwin, Harvard professors Rosabeth Moss Kanter and Regina Herzlinger, and learning organization expert Peter Senge are among those who share their knowledge and experience in this essential resource. Their essays will spark ideas, open doors, and inspire all those who face the challenge of leading in an ever-changing environment. FRANCES HESSELBEIN is chairman of the board of governors of the Peter F. Drucker Foundation for Nonprofit Management and editor-in-chief of Leader to Leader. She was awarded the Presidential Medal of Freedom, the nation's highest civilian honor, in 1998. PAUL M. COHEN is managing editor of Leader to Leader and coauthor of Working Wisdom. He previously edited Tom Peters' newsletter, On Achieving Excellence. Part I: On Leaders and Leadership. 1. 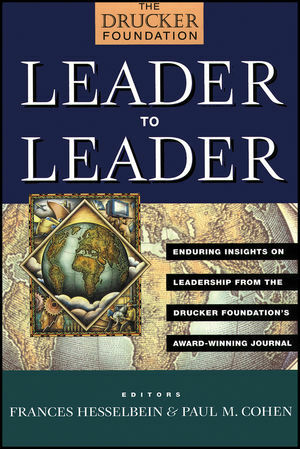 Peter F. Drucker: My Mentors' Leadership Lessons. 2. Frances Hesselbein: Managing in a World That Is Round. 3. Max De Pree: The Leader's Legacy. 4. Doris Kearns Goodwin: Ten Lessons from Presidents. 5. James M. Kouzes: Finding Your Leadership Voice. 6. Herb Kelleher: The Best Lesson in Leadership. Part II: Leading Innovation and Transformation. 7. Peter F. Drucker: The Discipline of Innovation. 8. Peter M. Senge: The Practice of Innovation. 9. John P. Kotter: Making Change Happen. 10. Gary Hamel and Jim Scholes: Strategic Innovation in the Quest for New Wealth. 11. Douglas K. Smith: Making Change Stick. Part III: Leadership in the New Information Economy. 12. Peter F. Drucker: The Shape of Things to Come. 13. Charles Handy: The Search for Meaning. 14. Sally Helgesen: Women and the New Economy. 15. Esther Dyson: Aligning Corporate Culture to Maximize High Technology. 16. Margaret Wheatley: Goodbye, Command and Control. 17. Kevin Kelly: The Soul of the Network Economy. Part IV: Competitive Strategy in a Global Economy. 18. Rosabeth Moss Kanter: How Locals Can Win Global Contests. 19. Ann Winblad: Leadership Secrets of a Venture Capitalist. 20. Kenichi Ohmae: Strategy in a World without Borders. 21. David A. Nadler, Mark B. Nadler: The Success Syndrome. Part V: Leading for High Performance. 22. Stephen R. Covey: The Habits of Effective Organizations. 23. Steven Kerr: GE's Collective Genius. 24. Jim Collins: Aligning Action and Values. 25. Charlotte Beers: Building Companies Worthy of Devotion. 26. Noel Tichy: The Mark of a Winner. 27. Bob Nelson: Creating an Energized Workplace. 28. Jeffrey Pfeffer: The Real Keys to High Performance. 29. Linda A. Hill: Developing the Star Performer. 30. Leonard Berry: Leading for the Long Term. Part VI: Building Great Teams. 31. Warren Bennis: The Secrets of Great Groups. 32. Jon R. Katzenbach: Making Teams Work at the Top. 33. J. Richard Hackman: Why Teams Don't Work. 34. Marshall Goldsmith: Coaching for Better Teamwork. Part VII: Leadership Across the Sectors. 35. John W. Gardner: Leadership in the Cities. 36. Regina Herzlinger: Full Disclosure: A Strategy for Performance. 37. James E. Austin: The Invisible Side of Leadership. The Jossey-Bass/Drucker Foundation Partnership site Browse the full catalog of Drucker products with Jossey-Bass. Leader to Leader is an inspiring examination of mission, leadership, values, innovation, building collaborations, shaping effective institutions, and creating community. Management pioneer Peter F. Drucker, Southwest Airlines CEO Herb Kelleher, best-selling authors Warren Bennis, Stephen R. Covey, and Charles Handy, Pulitzer Prize winner Doris Kearns Goodwin, Harvard professors Rosabeth Moss Kanter and Regina Herzlinger, and learning organization expert Peter Senge are among those who share their knowledge and experience in this essential resource. Their essays will spark ideas, open doors, and inspire all those who face the challenge of leading in an ever-changing environment.